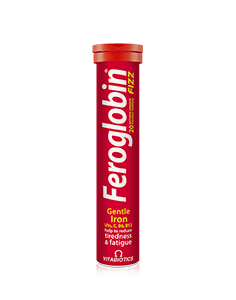 Feroglobin Fizz is gentle iron supplement with supporting nutrients in an effervescent formula that makes a refreshing, natural orange flavoured drink. It is ideal for those who prefer an alternative to capsules. Iron is a vital mineral and contributes to the normal formation of red blood cells, haemoglobin, and normal oxygen transport in the body. Feroglobin Fizz has a unique formulation that delivers iron in liquid form and avoids excessive levels, so is gentle on the stomach. As well as being important for blood formation, iron together with nutrients such as vitamins B6, B12 and C contribute to normal energy release, and help to reduce tiredness and fatigue. Vitamin C also increases iron absorption, while copper supports normal iron transport in the body. Available from pharmacies and health stores. To order Feroglobin Fizz online please click here. EFFERVESCENT IRON, VITAMIN C, ZINC & COPPER TABLETS. DISSOLVE ONE TABLET IN A GLASS OF WATER TO MAKE A REFRESHING ORANGE FLAVOURED DRINK. Take once daily. Do not exceed recommended intake. Store below 25°C, in a dry place, out of sight and reach of children. Why has Feroglobin Fizz been developed? When is Feroglobin Fizz recommended? Can Feroglobin Fizz be used simultaneously with medications? How many effervescent tablets does one pack of Feroglobin Fizz contain? How and when should Feroglobin Fizz be used? Are there any undesired effects whilst taking Feroglobin Fizz? Is Feroglobin Fizz suitable for vegetarians and vegans? "I just want to say how fantastic your Feroglobin slow release capsules are. 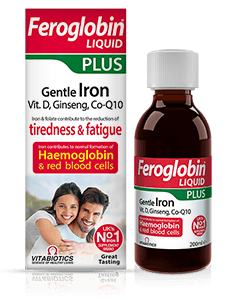 Having... been through several investigations and unable to take other forms of iron, my doctor heard about Feroglobin, the improvement was rapid and my health changed beyond belief. 2 years on I continue with this fantastic product and have told many people of its success. Thank you." "My daughter has been taking Feroglobin Liquid for about 6 weeks. The difference in her is amazing. She's like a different child. She is so happy, smiling, is more sociable, eats better, sleeps better. It's made a huge difference to her life and to ours as we're less stressed as she isn't having a tantrum all the time. Thank you so much"
"Feroglobin is literally life changing. For about 5 years I have been down, tired, irritable, over eating. Doctors found I had low iron but iron and vit c tablets didn't seem to make much difference. I have been taking Feroglobin for about 3 weeks and it's changed my life - more energy and willpower, less grumpy, amazing skin......just incredible. " "Can't recommend this enough. I'm going through perimenause at the moment, and this had help me so much with the tiredness and energy. " 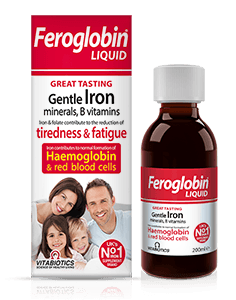 "I've been using Feroglobin liquid for about a week. It has absolutely made me feel fresh and better and I can feel this when doing exercise. Thank you"
"Feroglobin capsules really do help with my energy levels. I ran out recently and wondered why I was feeling so tired and fatigued and realised it was because I was not taking the capsules. I highly recommend these capsules and they are gentle on your stomach and do not cause constipation problems like some I have taken." "I have been exhausted for ages, took different supplements and nothing worked. Thought it was just me. I was recommended Feroglobin and wow! It's my 3rd day on this and I don't feel the need to fall asleep as soon as I get home from work. My quality of life has changed in such a short period of time and I wanted to say thank you." "I bought some of your Feroglobin and could actually feel my energy levels start to creep up again. My blood count came back up amazingly fast too - so thank-you!" "Hi, I take the Feroglobin Liquid iron which is brilliant and I will not stop using this as my nails are growing and I have no cravings to bite them (first time in 42 years)." "I bought Feroglobin Liquid and Omega-H3 (capsules) from Dubai and found it very helpful to my health. I recommend it to all who need vitality and sound mind. " "Feroglobin has put me on track. My Dr said I was low on Iron, I couldn't understand it as I have a healthy diet that I thought was Iron rich. He told me that so many vitamins and good stuff is lost from source and in the cooking process, that I needed to top up. I got your product Feroglobin and now feel great, thank you so much. " "A wonderful product which worked wonders on my 5 year old to support blood cell count." "We got these for my daughter and were astonished how much they helped. So impressed." "I wanted to make a comment on Feroglobin liquid. I have been trying to look for a formula which contains all the ingredients and is vegetarian. 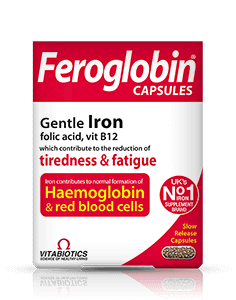 Taking Feroglobin for a couple of weeks has helped me maintain my energy levels. "I have always suffered with low iron, i have always used iron tablets in the past, which made me feel a bit better than before, but i was still feeling tired all the time with no energy so i tried feroglobin liquid i have taken it for about 2 weeks now and i feel so much better, stronger and more energy and alert, i will definitely be using this all of the time now. Thank you vitabiotics i have found something that really works." "Last time I took this my iron level rose. Really struggle to take all other forms of iron. Thank you Vitabiotics." "Hi there.. I spotted your product Feroglobin (liquid). I started taking it the next day, so have been taking it only 3 weeks. I feel stronger and had more energy within a few days, and it has really helped me maintain healthy blood and I feel a lot better. Both my sisters are now taking Feroglobin, which I have bought for them through your internet shop for their general health. I will keep you updated." "As an athlete combining training with fulltime work i was constantly feeling rundown. My doctor recommended iron supplements as my blood counts were just scraping within the lowest limit for an 'average' person. A month before the cycling season (which incidently is a winter sport in australia) I started taking Feroglobin and within days could feel the improvements. Efforts on the bike were stronger and longer and i feel i could dig a lot deeper during races. I am once again in the process of ordering more Feroglobin...thanking you Patrick Varas"
"My blood count used to to be in the 20's, now it is in the 40's. And, it did not take long. I recommend this to my friends and coworkers. Also, it does not cause constipation for me. Thank you very much Vitabiotics." "I am now 26 years old and I have been using Feroglobin since I was in high school in St.vincent and the Grenadines. Unlike other tonics that made me drowsy and taste awful, Feroglobin is to the contrary. Its literally delicious and it gives you that needed boost in a flash. I was initially drawn to it because of its natural composition. It works, and it works fast. I told every body about this. Now I have introduced my Mom and fiance to Wellwoman, and they love it. VITABIOTICS Keep good work going!" Always read the product directions before use. Do not exceed the recommended intake. As with other supplements, seek professional advice before using if you suffer from food allergies or are allergic to any of the ingredients. Vitamin supplements are not intended to treat or prevent any disease. Food supplements must not replace a balanced and varied diet, and a healthy lifestyle. This product contains iron, which if taken in excess may be harmful to very young children.